Information is given on the scientific-methodical, technological, and computer developmental works lying in the heart of a diversified set of software tools used in thermodynamic and thermal engineering calculations, for professional training of specialists in thermal power engineering, and for education of students. Today, when the tasks to be solved in power engineering are becoming more and more complicated and the requirements posed to the knowledge and skills of the operating personnel of thermal power stations (TPSs) are becoming more and more demanding, reliable and economically efficient operation of power-generating equipment cannot be guaranteed without making wide use of informational technologies, including the Internet and intranets. Informational and telecommunication technologies are used in higher schools at an increasingly growing rate; much attention is being given to development of electronic educational resources: textbooks, problem books, laboratory tutorials, and knowledge testing systems. The possibility of remotely using them is also envisaged. The way the process of professional training, retraining, and advanced training of the TPS personnel is organized is in many respects similar to the education process at higher schools: the trainees at TPS, as well as students at higher schools must gain the basic theoretical knowledge in general-education and special disciplines. However, operating personnel already possess many professional skills, they have experience in taking technological decisions and implementing them in practice within a limited interval of time. The training of specialists at higher schools is also aimed at working out certain general skills in them, although these skills might be not so wide as those required for carrying out operative control, maintenance, and repairs of power-generating equipment. The commonness of the tasks and objectives that have to be achieved during professional training of operators and young specialists, the sophistication of computer engineering, and the development of Internet were the factors that prompted the small team of the MEI Chair for Technology of Water and Fuel to develop an electronic encyclopedia of physicochemical technologies in power engineering, the work on which was started in the 1980s [1—13]. Later on, this team has grown in number to involve students, as well as and workers of the limited society Trieru. Among the people who were also involved in the work on the encyclopedia were teachers of the Chair for Boiler Units and Environmental Problems of Power Engineering, the Chair of Steam and Gas Turbines, the Chair for the Theoretical Principles of Thermal Engineering, the Chair of Thermal Power Stations, the Chair of Chemistry and Electrochemical Power Engineering, the Chair for Heat-and-Mass Transfer Processes and Installations, the Chair of Engineering Graphics, and others. 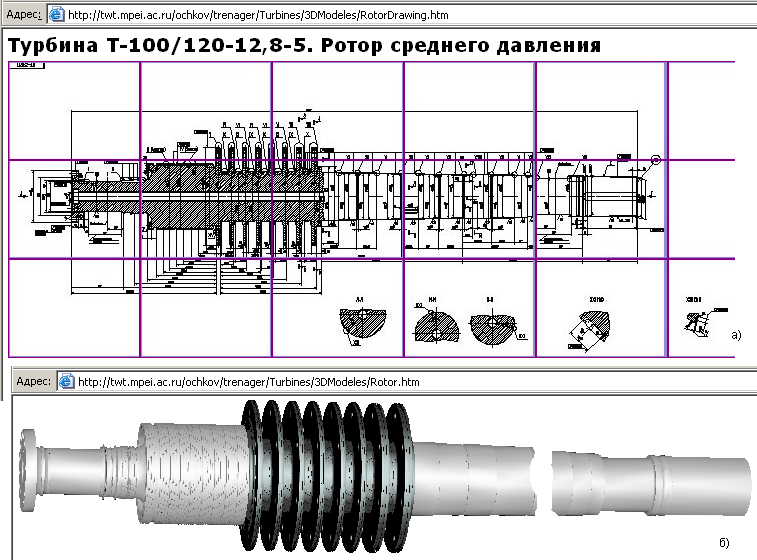 Among the sources that were additionally included into the encyclopedia were the soft (electronic) versions of materials presented by a number of Russian and foreign firms and organizations (the All-Russia Thermal Engineering Institute, ORGRES, Siemens, Tekhnopribor, Dow Chemical, Rom and Haas, Bayer, and others); sections of the reference series titled Thermal Engineering and Thermal Power Engineering, monographs, textbooks, tutorials and methodical books for the education disciplines relating to the above chairs. These materials incorporated, the initial version of the encyclopedia became broader in scope; it has now been called the Electronic Encyclopedia of Power Engineering (EEPE), the materials of which are enclosed into the author’s computer tool wrap TVT Shell.(www.trie.ru). The use of the EEPE should help improve the quality, competence, and professional skills of the personnel who serve the equipment of thermal power stations. To confirm the significance of making the operating personnel of thermal power stations more reliable in terms of their professional skills, we can refer to the calculations carried out by the American economist E. Denison, according to which 16% of the today’s economic growth in the United States has been achieved due to increasing the educational level of manpower, and 34%, due to technical innovations and know-how, factors also stemming from the education system. (iii) software facilities (training simulators) for improving and assessing the professional skills of the operating personnel of chemical departments at power stations and heating networks. Given below are the brief characteristics, purpose, and contents of some EEPE sections. 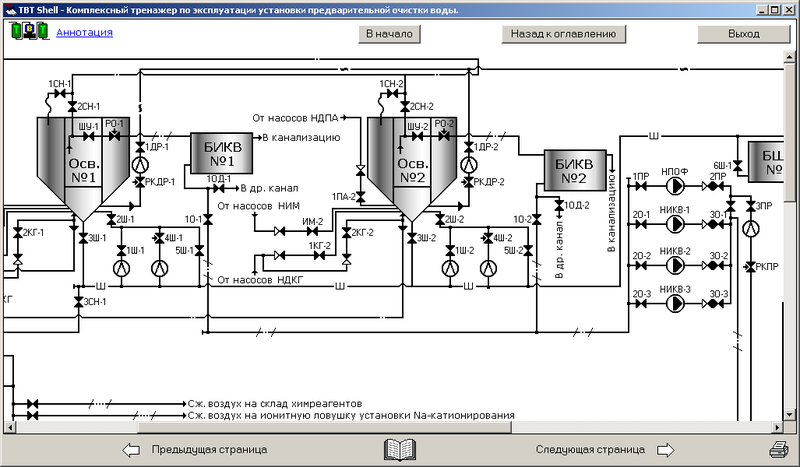 (1) The software system WaterSteamPro (www.wsp.ru) has been developed for calculating the main properties of water and steam over a wide range of operating parameters using the equations suggested by the International Association for the Properties of Water and Steam (www.iapws.org). The WaterSteamPro system has been integrated into the Internet using the technology Mathcad Calculation Server. The application computer programs can be used in all popular software packages (from Excel to Maple) that run both on personal computers and servers. (2) The list of tasks that run on the server includes standard and special problems in the field of thermal engineering and water treatment; such an arrangement allows the users to start calculation documents on the server and to access them remotely via the Internet in the interactive mode, thus making it unnecessary to install special licensed codes on the computers of users. For example, certain power performance characteristics of turbine generators can be calculated as functions of several parameters, these characteristics can be compared with the typical values, or problems contained in guiding documents in a text format can be solved, all in the automatic mode. For the development of the software package Russian Mathcad Application Server, the team of the Moscow Power Institute was awarded with a diploma of the All-Russia Exhibition Center in 2006. (vi) reagent storage and preparation systems. The training devices were developed so that the operations on starting the technological equipment from standby mode or after repair and on running it during normal operation could be simulated; this allows the tasks pertinent to the basic training of maintenance personnel to be solved. In addition, the devices were augmented with functional modules simulating the occurrence, development, and removal of emergency situations themselves, as well as their consequences. A new line in the development of training devices simulating the operation of water-treatment plants for chemical departments that are being retrofitted or constructed anew, namely, the use of project documents, is worth mentioning. This will allow the maintenance personnel to learn the operations on running new equipment well before it is put in operation. Apart from training simulators for water treatment plants, training devices have been developed for power installations equipped with type K, T, and PT turbines able to simulate the keeping of water chemistry and monitoring it when boiler and turbine equipment operate under normal (design) operating conditions and when typical malfunctions related to deviations from normal water chemistry occur (a wide range of such malfunctions can be simulated). Figure 3 shows the main screen of the training simulator for keeping water chemistry with the scheme for automatic and manual monitoring of chemical conditions for a district power station equipped with K-300-240 turbines. (v) whether the operator knows and can use calculation procedures in the technology of water treatment and maintenance of water chemistry. Once the contest is over, the set of integrated training simulators, including those produced on the order from a TPS, is handed over to the customer and can be used for educating the personnel, checking their knowledge and skills, and retraining them for the personnel to acquire higher qualification categories and to master adjacent jobs; this, undoubtedly, would help enhance the professional level of the workers of chemical departments and the safety of their labor. That the materials included into the Electronic Encyclopedia of Power Engineering are of considerable practical value is confirmed by the fact that they are being used as tutorials at 50 education organizations training specialists in power engineering, and that they have been introduced, as a matter of factory standard, at more than 200 power enterprises. Specialists of MEI and OOO Trieru constantly conduct creative work on filling the EEPE with necessary materials, one of the outcomes from this work being new training systems . 1. L. A. Zaitseva, A. S. Kopylov, A. V. Ochkov, et al., “The Automated System for Educating, Examining, and Training the Personnel of Chemical Departments at Thermal and Nuclear Power Stations,” Vestn. Mosk. Energ. Inst., No. 5, 15—18 (1995). 2. M. A. Rakhaev, A. V. Ochkov, V. F. Ochkov, et al., “Simulators for Training the Operators of Water Treatment Plants at Power Stations,” Teploenergetika, No. 7, 68—72 (1998) [Therm. Eng., No. 7 (1998)]. 3. V. F. Ochkov, V. F. Utenkov, and K. A. Orlov, “Thermal Engineering Calculations in the Mathcad Environment,” Teploenergetika, No. 2, 73—78 (2000) [Therm. Eng., No. 2 (2000)]. 4. A. S. Kopylov, V. Ya. Kaplina, V. F. Ochkov, et al., “An Automated Technology for Training Operators to Perform Emergency Actions when Abnormalities Occur in Water-Chemistry Regimes at Unit-Type Power Stations,” Vestn. Mosk. Energ. Inst., No. 2, 22—28 (2002). 5. V. F. Ochkov, V. N. Kaurkin, and V. N. Piskov, “Development of Methods for Studying Power-Generating Equipment Using Computer Graphic Tools,” in Proceedings of International Conference on Information Tools and Technologies (MEI, Moscow, 2004), Vol. 2, pp. 71—74. 6. A. A. Aleksandrov, K. A. Orlov, and V. F. Ochkov, “Investigating the Circuits of Combined-Cycle Plants with Injection of Steam into the Gas Path Using the Developed Application Computer Programs for the Properties of Working Fluids in Combined-Cycle Plants,” Nov. v Ross. Elektroenerg., No. 4, 28—32 (2004). 7. V. F. Ochkov, “Open Calculations in the Internet of Water Treatment Processes,” Energosber. Vodopodg., No. 3, 72—73 (2004). 8. A. A. Aleksandrov, V. F. Ochkov, and K. A. Ochkov, “Equations and Computer Programs for Calculating the Properties of Gases and Combustion Products, Teploenergetika, No. 3, 48—55 (2005) [Therm. Eng., No. 3 (2005)]. 9. V. G. Gribin and V. F. Ochkov, “The Corporative Atlas of Power-Generating Equipment: Problems and Solutions,” Nov. v Ross. Elektroenerg., No. 2, 42—49 (2006). 10. A. S. Kopylov, K. A. Orlov, V. F. Ochkov, et al., “Software Tools for Improving and Assessing the Professional Skills of the Personnel of Chemical Departments,” Energosber. Vodopodg., No. 1, 19—22 (2006). 11. S. G. Magid, I. Sh. Zagretdinov, S. V. Mishcheryakov, et al., “Individual, Group, and Social Needs for Enhancing the Professional Skills of the Personnel Engaged in the Electric Power Industry (on the Question of Holding Contests of Operating Personnel),” Energosber. Vodopodg., No. 2, 43—56 (2006). 12. Yu. V. Arbuzov, O. A. Bondin, A. I. Evseev, et al., Development of Informational Support to Engineering Equipment: Electronic Educational Resources of the Moscow Power Institute, Ed. by S. I. Maslov (Izd. Dom MEI, Moscow, 2006) [in Russian]. 13. SO (Enterprise Standard) EES-PP1-2005: A Standard for Arrangement of Professional Training, Retraining and Enhancing the Skills of Personnel (OAO RAO UES of Russia, Moscow, 2005) [in Russian]. 14. N. Yu. 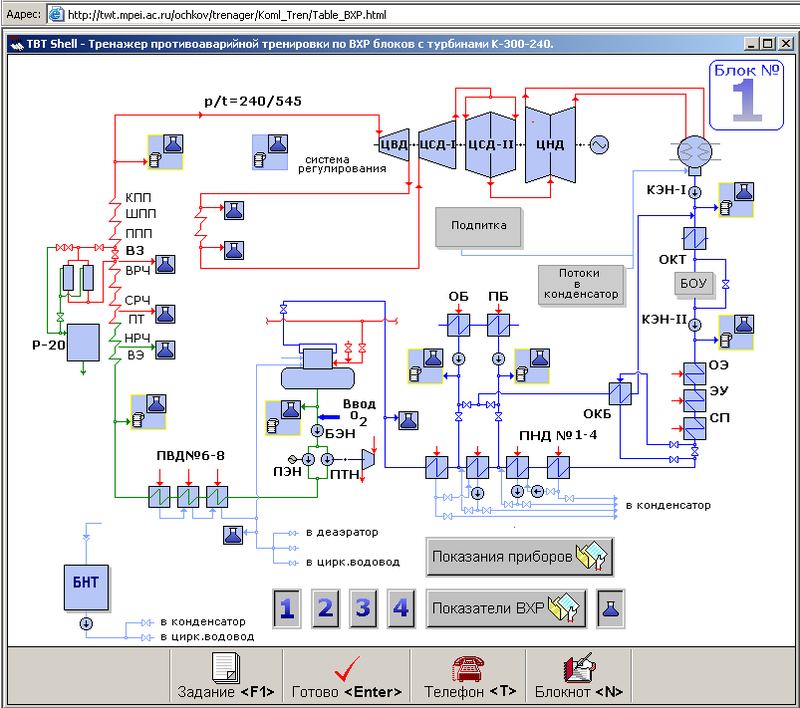 Pevneva, V. N. Piskov, and A. N. Zenkov, “An Integrated Computer-Based Training Simulator for the Operative Personnel of the 800-MW Power-Generating Unit at the Perm District Power Station,” Teploenergetika, No. 7, 31—35 (2007) [Therm. Eng., No. 7 (2007)]. Fig. 1. Example of a 3D multimedia model of an item of power-generating equipment. (a) Drawing in a vector format, (b) 3D model. Fig. 2. Screen of the training simulator for operating the water pretreatment plant. Aux---auxiliaries; SlTh---sludge thickener; CR---cutoff regulator; Clr---clarifier; Dr---drain; CS---coagulant solution; DCV---drain control valve; Sl---sludge; LCWT---lime coagulated water tank; ClDr---clarified drain; PAMP---polyacrylamide metering pump; LMP---lime milk pump; CMP---coagulant metering pump; LM---lime milk; PA---polyacrylamide; CFWP---clarifying filter washing pump; W---washing; LCWP---lime coagulated water pump; WCV---washing control valve; SWT---sludge water tank. Fig. 3. Screen of the training simulator for the maintenance of water chemistry. CSS---convective steam superheater; PSS---platen steam superheater; ISS---intermediate steam superheater; BGV---built-in gate valve; URP---upper radiant part; MRP---medium radiant part; CWW---ceiling waterwalls; LRP---lower radiant part; WE---water economizer; HPH---high-pressure heater; LPT---low point tank; UECP---unit electrically driven pump; EFWP---electrically driven feedwater pump; TFWP---turbine-driven feedwater pump; HPC---high-pressure cylinder; MPC---medium-pressure cylinder; LPC---low-pressure cylinder; MHWC---main heating-water converter; PHWC---peak heating-water converter; LPH---low-pressure heater; HCCC---heating converter condensate cooler; ECP---electrically driven condensate pump; TCC---turbine condensate cooler; CPU---condensate polishing unit; ESC---ejector steam cooler; GSC---gland steam cooler; GH---gland heater.